As long as you only have one person shooting at a time your gonna be hard pressed to generate interest. How much fun would it be to watch one dragster go down the track each time? If you set it up more like drag competition (quals then head to head match ups for who goes on in the ladder) you would see more interest. I'd be happy with PR that wasn't politicized. Their competition related tweets were sent out marking them as politically conservative items for the Twitter audience. I realize that the head of General Ops was a former head of the Iowa GOP, but I am really disappointed if that means the competitions are now being used to shut out moderates, liberals, and other non-strictly conservative participants. Hazcat's general idea regarding audience friendliness echoes my own thoughts in many ways. I think of NASCAR as the extreme example of audience friendliness. Say what you will but their attendance every weekend is Super Bowl-esque in proportions - that's EVERY TIME too. NASCAR is a Super Bowl every weekend. It might be that getting more eyes on shooting sports involves a fairly major paradigm change. Hazcat's "drag race shooting" is certainly a step in the right direction. I realize it is strange for us to think about how to make shooting sports interesting - because we're already interested. However, there's a big wide world that doesn't generally know that shooting sports exist. I think SASS and the North-South Skirmish people might have an edge as it's a lifestyle kind of thing - you cowboy up or get your blues and grays on, and there's more to the event than just the shooting itself. It is very aspirational - "I wanna be like Liberty Valence etc" in much the same way NASCAR is - "Hey I drive a Monte Carlo and have a handlebar moustache too!" Certainly, in mountain bike racing, dual slalom QUICKLY became the crowd favorite. Sure being able to see the whole race helped but people really like the head-to-head elimination-style racing. I echo some of the above: Fewer partisan comments and more head-to-head competition will help the shooting sports. I am no way no how interested in watching/reading/hearing about shooting competitions. Nor can I think of any of my shooting buddies who would sit down to watch a match either on TV or the internet. And we're all shooters, not hunters. Watching shooting competitions on TV is like watching bowling only less so. For the competitors, the events are great, for the general audience of shooters, not so great. So I could be totally off base but I think some of the issue with audience interest is how these these get filmed. There was a time when watching poker on TV was super lame now its super cool. All because of tiny cameras that could see the hands. (although play into the all tactical all the time) would be if a few competators allowed themselves to have small cameras on them either in the form of a baseball cap or a gun cam. The gun cam would provide great footage although it would mean new holsters and such. I am thinking do it like they do on football where a few players are "mic'd up"
Also in an odd way I think the over tacticoolness of some competitions are what makes things like SASS keep going. Its about comparison. NJ Larry...from Brother Emerson, "A foolish consistency is the hobgoblin of little minds, adored by little statesmen and philosophers and divines." Seriously, I'm cool with tactical whatever, and lord knows I've made a lot of money from it. But somewhere along the line people stopped shooting the guns. I believe in competition both as a sport and as a tool..you've heard my spiel on artificial stress...and I don't like to see it get marginalized because "operators" are afraid they're going to accidentally "program" non-tactical moves. The industry moves in whatever direction the money moves. I think competition is an important funnel for bringing in newcomers, which is why I've championed (and consistently lost on the issue) .22 rimfire competition. Don W., you're right. Bitter, so are you...that actually pisses me off, considering that conservatives are usually the first in line to give us the BIG BONE! Competitors will NOT allow themselves to be wired...the closest we came was Todd Jarrett at the Steel Challenge show a few years ago, and that two-parter was the highest-rated shooting competition show EVER...the next year, NOBODY would let us near them with microphones. It was hard on Todd — and he was an absolute TROOPER — and word got around. The shooters like the competing magazine show's format...it's easier on them, but there's less there for the non-competing viewer. Cowboy probably does lead the way. I've shot them all, and I just love cowboy action shooting. Heck, I do a whole show on it. I just bought a new cowboy hat, too. The gun closest to my hand right now is a single action revolver, a Cimmarron Thunderer .44 Special (and yes, I know a certain magazine says .44 Specials are crap in this issue, thus identifying what the writer is full of). I'm not undergunned. Cowboy does a better job of brining in newcomers and women by far. Not sure if I wanna watch the matches on TV but a better web presence would be nice start. Finding out the standings through out the days initially took some digging. A little twitter bot would have been a nice. I don't see how Bianchi cup survives as anything but some oddity that happens once a year. There isn't a club level event within 500 miles of me that I am aware of. It has no club following in the South. I would maintain that the vast majority of people who are interested in any major event like this are ones who participate locally in the sport. Steel Challenge will grow because of the USPSA tie in, but Bianchi Cup is doomed on that count. if it were not for the shooting media's fascination with it, I don't think I would be aware that the silly thing still existed..
how many particpants nation wide in this very obscurve shooting game? how many clubs that shoot it once a month??? Haz's comment that one competitor at a time, fails to generate interest is accucate. I would also submit that the same shooters every year, one at a time is also adding to a decline in interest. It's my understandind that Bianchi Cup started out as a Law Enforcement competition. If so, then the competition should be limited to "invited" LE, or factory, sponsered teams. There could be a head to head shoot off after the team competition to determine the top shooter. I would also limit the number of years a shooter could compete. As I said, it's the same guys over and over again. After a while you just loose all interest. I've been a dedicated shooter for 40 years, readers of the forum can judge if my interest in guns is "marginal". I've been to ONE shooting match in my life as a spectator and i stayed for 20 minutes and had enough, I was bored to death. Shooting sports have nothing currently to offer the TV viewer. With your experience with "Cowboys" you should know what I mean, Even where the "Walter Mittyism is present as in CAS and NSSA it is darn difficult to communicate that through video. Even the greats like Annie Oakley, Herb Parsons, and Ed McGivern, drew their crowds in large part because there was not much else available for entertainment. 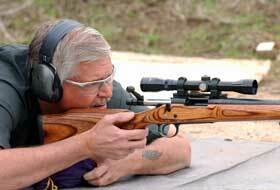 We must find a way to make other shooting sports more interesting to spectators. There is already a "sport" + "shooting" event. It's in the Winter Olympics, called Biathlon. Outside of Olympic's fanatics, no one in the non skiing or shooting communitee has even watched it or heard of it. BUT, I just returned from a two day SASS shoot, now THAT is FUN pardner! Pardon my shameless plug, MB, if you want to see first shooting match views, go to video.google.com and type in " posercam " at the search window. I also have started to put some vids up on YouTube. Again just type in " posercam ". One of the things that pushed me over the edge in buying a "hatcam" was Shooting USA's coverage of the USPSA's 3 gun Nationals. 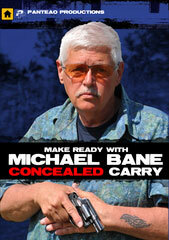 They had a pro-tip segment on there with Jerry Miculek wearing a "hat cam". Actually, I was hooked way back in '94 when I caught a show on ESPN. I think it might have been a big match sponsored by Colt at the time. It showed a much younger Rob Leatham going through a course swinging left and right with his pistol shooting these steel plates. Man! I was hooked then! That looked like fun. Just my opinion, anything that involves shooting paper is going to be anti-spectator friendly. So that means either a target that goes "CLANG!" or falls over when hit. Or both. Hence, Phil Strader might have something good with his revamped Pro-Am match down in Tulsa. 1. what local club/range is going to pay out the bucks to have a moving target system installed at their range (heck, we have enough problems with guys shooting day glow orange painted baffle supports)? 2. at the deep end of the Bianchi Cup pool, it takes some very specialized guns and holsters to shoot. Moreso than USPSA's Open division, which has me balking at the price of $2,500 Open gun and then paying $100 to $120 for each mag. There is NO WAY I am blowing $2,500 for a gun that can only be shot in one match a year. I am not all that knowledgeable about two other big shooting events that at least in my opinion have waned over the years. The first is or was the Chevy Sportsman's Team Challenge. I guess that match still goes on each year. The other match is the American Handgunner held, I think, in Colorado each year. Why have those two matches just about have disappeared off the radar entirely? I had the privilege of being invited to the First 4 Bianchi Cups. and attending the first 2 matches. After 30 years I returned to the cup this year. First of all the NRA has started a new class Production with will level the playing field by the class. Second you do not have to spend a fortune to compete. I used my standard Govt 45 I did in 79 and 80. It is the same one I used for IPSC between ’76 and late ‘80’s. My reason is I enjoy shooting and competing. If I only went to matches to win I’d never attend a match. The only one that is not multiple shooters is the Mover. Speeking of mover. I had no mover available for practice yet all I had to remind my self, when I shot was sight picture and how much to lead. (a 45 @ 800 FPS requires 4.5 “ lead at 10 yards, 6.75” at 15 yards, 9” at 20 yards and 11.25” at 25 yards). Which means Pick out a spot at the correct distance on the target and swing and fire. Do not complain about a match until you try it your self. The fun is in the competition, (yes and winning is fun but we all can’t win first prize), and the comradey that is shared at matches like this.